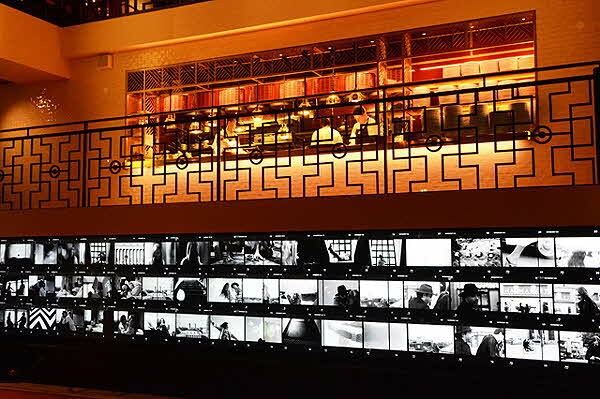 Enter this new Stockholm hotel and you immediately get a whiff of an era long gone. From the extravagant art deco staircase and the fifty or so black-and-white movie screens to the crystal chandelier by Samuel Wilkinson for the lobby and the brightly lit kitchen on the balcony, everything exudes an aura of Hollywood, the Jazz Age, and the elegance of the Roaring Twenties. Meanwhile, the hotel is an ultra-modern, 21st century phenomenon. 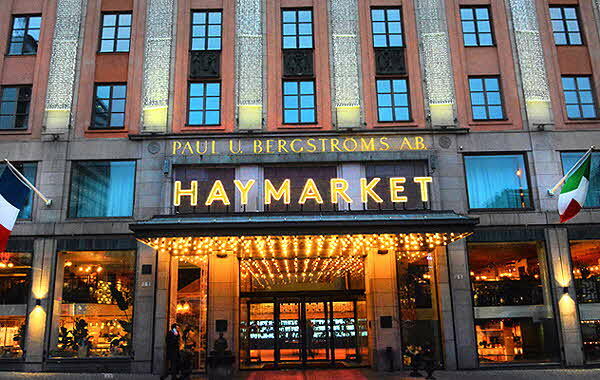 In a way it all began with Paul Urbanus Bergstr�m, a successful businessman who was once a dominating force in and around H�torget, the market square in central Stockholm. In the early 1920s, he built a department store at H�torget, and named it PUB after his initials. As it happened, among his many employees was a young girl named Greta Gustafsson, who worked in the millenary department and posed for him as a hat model, and who was later to become one of the world’s most glamorous movie stars - better known as Greta Garbo. Now PUB is gone, converted into the Scandic Hotel Haymarket. All the same, PUB�s early days are still vibrantly alive. Not surprisingly, the hotel’s American brasserie is called Paul, and its wellness-oriented caf� is named... you guessed it... Greta’s. We came here on a snowy afternoon in mid-January, not exactly the recommended time to visit the Swedish capital. Still there was an air of festivity. The Haymarket is a lively spot to begin with. 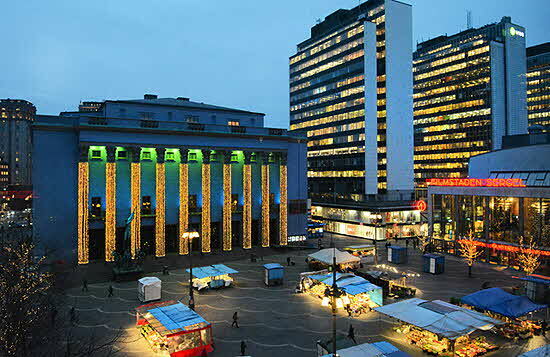 Across from the hotel lay the Royal Concert Hall, its tall columns still dressed for Christmas, and to the south you could see Filmstaden Sergel, one of the largest multiscreen cinemas in Stockholm. And, despite the cold, a few fruit and vegetable vendors had set up their wares in the market square, in brilliantly illuminated stands. Following our arrival I met with Daniel Herrmansson, the Food and Beverage Manager of the hotel. “Why Haymarket,” I wondered. “Why not call it H�torget? His answer was short and to the point: “Because, outside Scandinavia, no one knows how to pronounce H�torget. Which led to a chat about the international flavor of the place. Take Paul”s, for instance, a brasserie inspired by New York in the twenties, claiming to serve “decadent food” from both sides of the Atlantic. Checking the menu, I noted that it commenced with a listing of martinis such as Queen Elisabeth, Rockefeller, and Tuxedo #2. The list even had a small preface, enquiring whether you were a dilettante who preferred your martini stirred, or the reserved type who took it extra dry, or maybe a lounger who liked it dirty. Asked about what the Rockefeller was all about, Daniel informed me that it contained Tanqueray 10, Noilly Prat, and an oyster - but no hot sauce, so no similarity to oyster shooters in Annapolis, Maryland. 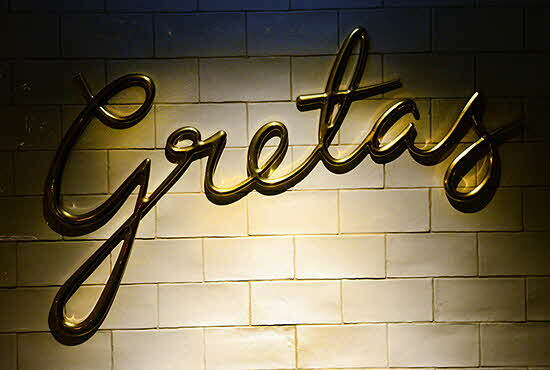 As for Greta’s, apart from focus on healthy food, it boasted everything from morning coffee to champagne in the evening. Passing by Americain, I noticed a small piano nearby. For “ragtime jazz in the evening”, explained Daniel. 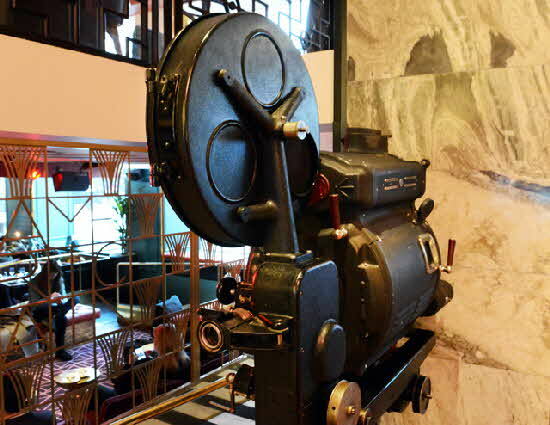 Then, next to the entrance stood a giant movie projector, surely, one of the first ever in existence. As Daniel put it, it’s “all the twenties with a modern twist”. Our room did little to detract from this notion. There was Garbo, in a row of black-and-white photos above the bed, one of which featured a Magritte-style hat suspended in empty space. 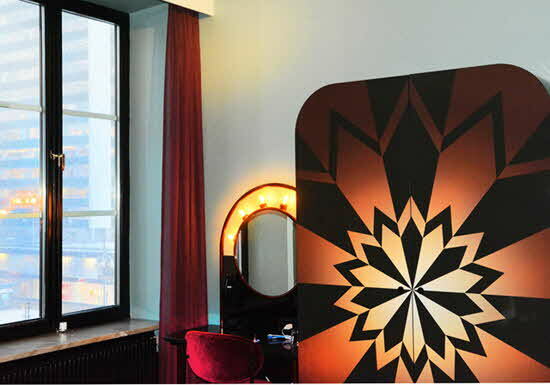 I particularly liked the bold star-like art deco pattern on the wardrobe, a freestanding piece of furniture that also contained the in-room safe, as well as a refrigerator with a mini-bar. And then there was an old record player, along with a few records, such as the all-time greatest hits by Roy Orbison, Mozart”s symphony #36, and Earl Bostic playing sweet tunes of the roaring twenties.